It’s a typical, warm spring day in Texas, and you have plans to head down to Lower Greenville to grab a bite to eat with friends. Before you can get out of the house, though, you’re hit with an intense pain that shoots up one side of your face. Now your plans are derailed, and you find yourself needing relief. 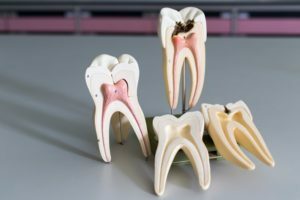 Your local dentist says you may need root canal therapy in Richardson, and as you continue reading, you’ll learn about everything that is involved in this procedure. Soon, you’ll be back to normal! A root canal is a procedure used to restore a tooth that has advanced decay. By the time that you’re in need of one, bacteria have moved past the enamel, through the more sensitive dentin and into the inner tooth. The majority of the tooth’s nerve activity happens in this area, which is what causes the intense pain sensations. Root canal therapy is the best treatment process for advanced decay because it goes to the core of the problem to restore your tooth’s function. Many people have a phobia about the root canal process because of old folk tales and horror stories. The truth is that any discomfort felt from the procedure is no worse than that of a routine cavity filling, and that’s thanks to the marvelous advancements in the world of dentistry. Before anything is done, your dentist will capture images of your oral cavity to pinpoint where the decay is. He will then make an incision in your tooth that allows access to the decayed tissue in the inner area. The dental expert will remove the decayed tissue, clean the area and pack it with a special compound called gutta-percha. The final step is to place a protective cap over the tooth while the root canal heals. After a sufficient amount of time has passed for you to heal, your dentist in Richardson will invite you back in to be fitted with a custom-made crown, which will leave your tooth completely restored. When you have decay that has penetrated into the inner tooth, you have a limited window of time to act. That’s because bacteria never stop moving, will continue to wear down precious material and dissolve the connective tissues that are holding your tooth in place. Thus, one of the dangers of waiting too long is that you’re more susceptible to tooth loss. So when the first sign of intense pain appears, reach out to your dentist to schedule an appointment, so that you can soon be fully restored. Dr. Afshin Azmoodeh has been providing comprehensive care to the Richardson community for nearly two decades. Since graduating from the Texas A&M College of Dentistry, he has remained passionate about helping his patients experience excellent oral health. Dr. Azmoodeh specializes in all forms of restoration – including root canal therapy, and practices at Canyon Creek Family Dentistry. He can be reached for more information through his website.